I homeschool my daughter for preschool so I am always looking for new ideas and educational materials to make it fun and exciting for her! One of my favorite go-to learning companies is Lakeshore! Lakeshore offers innovative learning materials distinguished by their quality, educational merit and safety. Lakeshore’s new Gifts for Growing Minds collection is a unique and exclusive assortment of educational toys and games designed to help parents get their children excited about learning! Is it magic? No, it’s math! Amaze friends & family with fascinating illusions you perform yourself. Each trick comes with easy-to-follow illustrated instructions that explain how to perform the illusion. Then, after you’ve mystified your audience, you can reveal how math is the “magic” behind each trick! Includes everything needed to perform all 8 tricks. My son LOVES doing "magic" so I love that he can do magic AND practice his math! This is so fun and educational! These enchanting hardwood blocks let kids create medieval fortresses, palaces & more! These durable, stackable blocks come in 12 unique shapes & are printed on every side with a fun medieval theme—so kids can construct castles from all directions! Set of 60 blocks; largest is 6". Not scaled to unit blocks. My children LOVE building block towers and castles and now they can really build real castles with these blocks! 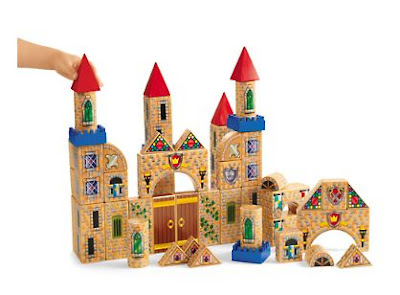 These are hours and hours of fun and so many types and sizes of castles can be built! Stinky feet…gooey snot… the human body is completely disgusting—and totally cool! This hands-on experiment kit is perfect for kids who are itching to learn all about how their body works. 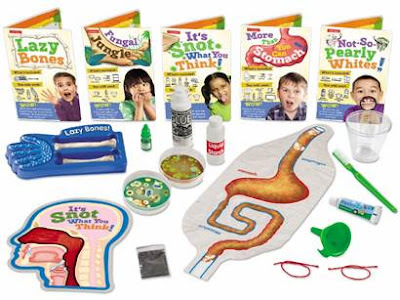 Five super-engaging experiments explore germs, digestion & more—as kids get totally grossed out and learn about the science that happens inside our own bodies! Includes 19 pieces, plus 5 experiment cards. Digestive system model is 20 1/2" long. Since I am a medical professional, I love teaching my kids about their amazing body! This kit is so perfect for showing them and experimenting! As you can, Lakeshore offers so many fun and unique kits for children to learn, experiment and have fun all day long! You can purchase all these items and many more from the Lakeshore website. 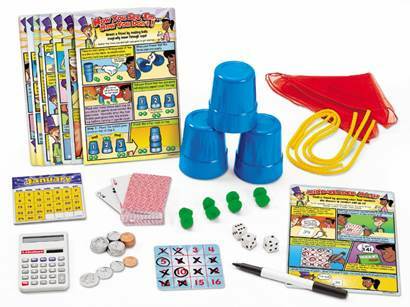 Lakeshore is generously offering (1) Be a Math Magician to a lucky winner!